We purchased our wrought iron patio table and chairs 12 years ago. I love their classic look and and the comfort of the spring chairs. Wrought iron is heavier than aluminum which means the furniture won't blow over. We think it is the best value for outdoor patio tables. 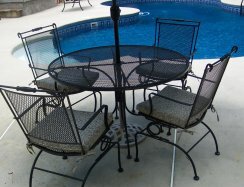 In fact, since we entertain so much around the pool we purchased an oval patio table made of wrought iron to seat 6 people. So now we have two sets that sit out by the pool. Black wrought iron is a classic look, easy to keep clean and an excellent value. The finish is powder coated and rust-resistant. Meaning it will eventually show some signs of rust. Look for them in the spring at stores like Home Depot or Lowes - however they don't carry them year round. 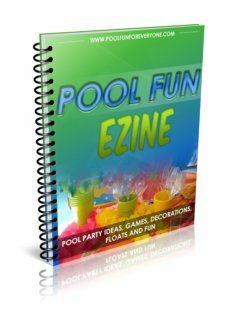 If you decide that this is the material you want you will need to make your purchase early in the season - spring or early summer. 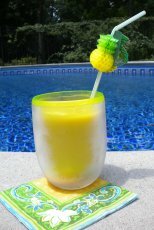 When I tried to purchase a wrought iron oval patio table from Home Depot the end of June for our Fourth of July pool party, the table was no longer available at the store or on-line. The best value is when you can purchase the table and the chairs as a set like this one pictured. These chairs come in different styles with either a low back or a high back. Some of them have a spring in them - so you can lean back and rock the chair which is a nice feature. Tables sizes and shapes include round, square, rectangle, and oval. We prefer the round or oval to the rectangular so if we need to squeeze in another guest, it's easier to do with an oval or round table. You will need cushions for these chairs - either just a pad for the bottom or one that provides comfort to the back and the bottom like this one pictured. I looked all over town for these cushions and found that if I type in wrought iron chair cushions at Amazon they come right up. These are sized to fit most wrought iron furniture, 20W x 37L x 2.5H, with a break- 20" from the top. Ties are used to secure the pads. The fabric is Sunbrella which is the best outdoor fabric that is stain and mildew resistant and the fabric doesn't fade. These cushions are made with Quick Dry Comfort Technology which means your cushions will dry really fast after a rain. To extend the life of your furniture and to help prevent the eventual rusting, protect it with a heavy duty cover in the winter (or store in your garage). There are lots of different quality covers available. We like this one made by Classic Accessories that is large enough to cover not only the table but all of the chairs as well. Air vents prevent the cover from ballooning and forming condensation which keeps the furniture dry and prevents mold. The laminated waterproof coating makes for a durable cover that actually has a life time warranty. We like the handles that make it easy to remove the cover or adjust it when necessary. I also happen to like the color of this one better than the light tan. There are 3 size options - so measure your table including the chairs to be sure you select the right size. Eventually your wrought iron patio table will show some signs of rusting. Especially if it is left outside year round and no furniture covers are used - as in our patio umbrella table and chairs. It may take longer to rust if an outdoor table cover is used when not in use or during the winter months. However the rust is usually just on the surface and so far on our furniture has not affected the chairs or table structurally. As you can see from this picture, there is some rust on the chairs. The table also show some signs of rusting, which has left some rust stains on our outdoor cement. 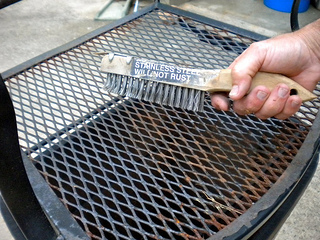 In case of rust, lightly sand the rusted area and use a wire brush to remove any loose or flaking paint. Use paint that is especially made for metal. 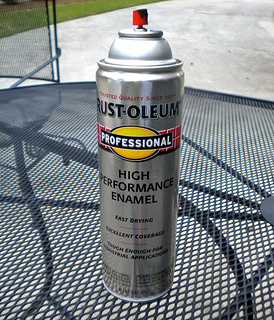 We like to use Rust-Oleum Professional High Performance Enamel Spray Paint. 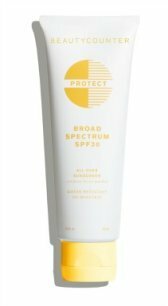 The spray is fast drying and actually helps protect against future rusting. It comes out evenly and provides a nice looking finish. Do your paint job outside as the fumes are really strong. 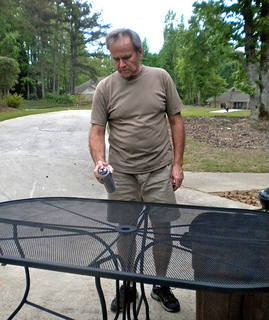 Pick a day that's not windy and slowly move the spray can across the top and then sides and bottom of the table. So instead of buying a new outdoor patio set, for under $10 you can have your wrought iron outdoor furniture looking like new.